For Further Information Log on to Facebook or call on 7698206821. 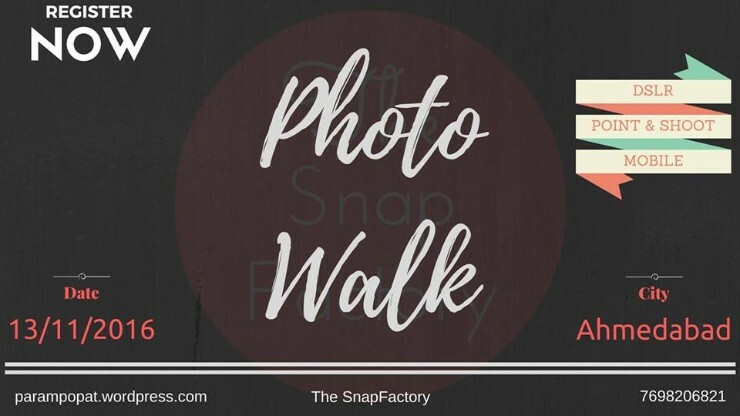 The SnapFactory is organizing a Photo Walk in the city of Ahmedabad on November 13th, 2016 (Sunday) for all the photo enthusiasts out there in the city! Even though you are not a professional photographer or don’t have a DSLR, you can participate in the walk and be eligible for exciting prizes! They have different categories for both Mobile Photographers and Camera Photographers.